Target has long supported nursing moms. Their policies encourage in store breastfeeding and if a mom needs to use a dressing room to pump or nurse it's made available. 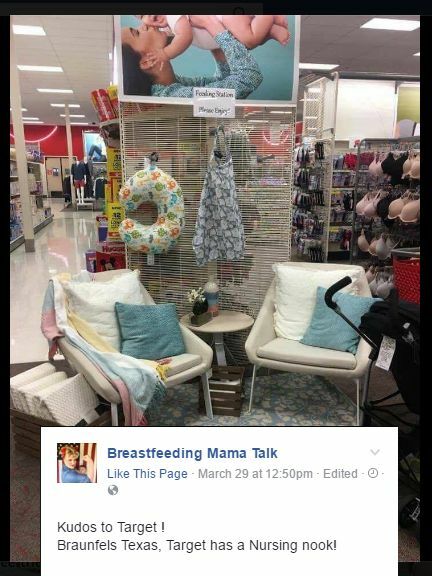 Recently Breastfeeding Mama Talk shared a new nursing nook set up in plain view in a Texas Target store. It was equipped with 2 comfy chairs, a table, nursing cover, boppy pillow and more. What a wonderful treat for moms who frequent this location! To search or rate a nursing room Target location in your area you can use the Moms Pump Here Nursing Room Locator App. To submit a local nursing nook you may also add it to our App or via the website.